What more can one ask for? Jet skis, kayaks, paddleboards, fly-boards, hoverboards, Go Float boats, go-karts, batting cages, horseshoe, skydiving, golf, putting greens & miniature golf &hyphen; all never leaving the island! Jacobsen Hardy&apos;s attention to detail provides residents and visitors alike with a premiere public golf course. Among the many improvements, the course features Paspalum turf, designed for seaside golf courses and providing an outstanding playing surface. To keep playing surfaces in top condition, a new water treatment plant and irrigation system were included in the renovation project. This improvement in water quality optimizes playing surfaces and also provides water for landscaped areas around the clubhouse and on the golf course. The course highlights its unique seaside tropical feel with 18 holes meandering through upland and lowland native areas, natural wetlands habitat of beautiful Sydnor Bayou and over 500 palm trees. The Batting Cages is a Great place for family fun! The Batting Cages offers baseball and softball machines with slow, medium or fast options. It`s a great place to spend quality time with family and friends. Come out and enjoy the FUN! Open all year-round. Whatever your pleasure, we`ve got all the right gear for your next adventure! Go karts and arcade games are available now! Flyboards, hoverboard, Go Float boats, kayak, paddleboards & paddleboard night tours. Magic Carpet Golf has been wowing kids and families for years. Featuring two colorful, fun-filled 18-hole courses for your enjoyment, Magic Carpet Golf is loaded with animated twists, turns, and trickery that`ll keep you entertained for hours. Why land in a field when you can land on the beach? Tandem parachute jumping over the ocean and landing on the beach takes your skydive experience to a whole new level of amazing that you cannot get jumping anywhere else! We are the only place in the USA where you land on the beach every jump. We work exceptionally hard to ensure you enjoy the safest and epic skydive experience. Beach landing tandem skydiving really is the most spectacular, best and only way to truly enjoy the thrill of 120mph free-fall. After that free fall, float under parachute canopy and soak up the amazing Gulf of Texas and Galveston Island views. The Island is truly amazing from 14000ft. Whether it&apos;s a life list thing, proposal, birthday, adrenaline fix or any other reason, we have you covered! We use the latest state-of-the-art parachuting equipment and meticulously maintained aircraft. We insist our Tandem Jump Instructors have qualifications above and beyond the USPA requirements. Instructors average a 1000 jumps per year and have been jumping since 1993. Skydive Galveston&apos;s jump pilot has more than 5000 hrs flight time. We are Veteran owned and operated. Allow our professional Veterans to land you on the Beach! Tin Cups Caddy Shack is a full-service bar and driving range with a large putting green and horseshoe pits. Looking to hit a small or large bucket at dusk? Just want to relax with a cold beer in hand? Tin Cups Caddy Shack is the place to be! Offering several tee boxes so even when there`s a full house, the wait isn`t too long! No matter the skill level, everyone is sure to have a good time! 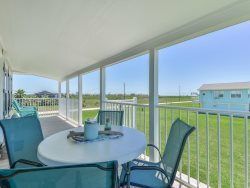 They also offer a large deck for outdoor seating to enjoy the beautiful sunsets. Whether it`s a way of working out stress, or maybe enjoying a day with friends or completing a business deal, they know the importance that a good round of golf can have in life. Sea Star Base offers a Schooner Sunday program every Sunday. Come out for the day and learn to sail, or simply just enjoy a day out on the water! Guests are invited to work the sails if they like, or even steer, as our Captains point out areas of interest along the route. Sea Star Base also offers private charters, if a couple or group interested in taking a leisurely sail.